Today I arose well rested after a good night’s sleep. I had asked for an extra blanket from the hotel staff. They brought me a thin one, so I was concerned that I would not be able to sleep with the cool of the night. It must have been a tender mercy of the Lord because I slept very well. We got a very late start because we were waiting for our breakfast, then to pay our bill. We stopped at the Village of Hope to check the cow and the heifer. The heifer was in heat but I don’t think that the cow is cycling. The fences were loose and the wire was broken in a couple of places. I talked to the maintenance man about it. I also walked through the large dome complex that is being built for a guest house. It was very nice for Ethiopian standards. It is hard to compare with US standards when you don’t have a Home Depot down the road! We looked at the hay that they had been storing at Kersa last week. It had been rained on and was a little damp so it had started to mold. I don’t think it will heat up but it will not be top quality feed. The alfalfa hasn’t grown up much but the leaves are very thick. In Shashamene Abera invited us to a juice bar. I had a mixed fruit drink that was very good, papaya, mango, strawberry. I guess that fruit drinks are very popular around here. Since we were down by lake Awasa which is filled with Tilapia fish we decided to try some. Teddy took us to the Lewi restaurant where I spent almost five dollars a piece on our meals. (For comparisons, it costs $5 to stay in some hotels here). It was very good food. I had fish and fries with an avocado drink. I was surprised at how sweet and good it was. One of my co-workers had an interesting trip this week. He was in a taxi on his way to meet us when a bicyclist rode in front of their vehicle. They thought at first that the man had been killed, but miraculously, he survived. The roads here are full of animals, people, bicyles, 3 wheel taxis, cars and trucks. 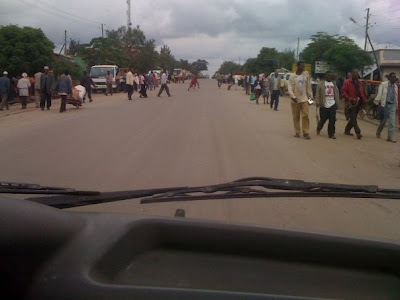 This picture is the main highway going from Addis Ababa to Kenya. The roads are very congested in the villages along the way. This evening I talked with charity organizers about the plans for Village of Hope and Ethiopian culture in general. There is so much that can be done that it is difficult to know where to start and how to keep going. I’m grateful to have the ability to turn to the Lord in prayer for guidance. I pray for relief from discouragement and guidance for each day.